On the day of First Holy Communion, friends and family of the Catholic Community at Relay bounded up the steps to the small church to see their children, grandchildren, and even great grandchildren receive this important sacrament. Yet not all family members were able to climb the stairs, so some used the newly constructed ramp leading to the church’s entrance. As with any church built in 1880, the Catholic Community at Relay (CCR) was peppered with steps and narrow passages until they embarked on a major renovation project to make the church more accessible to those with disabilities. The Knott Foundation helped fund the construction of a ramp leading up to the church’s entrance, which provides people in wheelchairs, with walkers, on crutches, or even those pushing strollers easy access to the worship space. “A large part of my healing is being back in my faith community,” lifelong CCR member, Elise Cole, proclaims. Due to a knee injury, the young mother of three has relied on crutches for nearly a year, so she is especially grateful for the ramp. In addition to solving a physical access issue, the construction project served as a community building experience for CCR. All 100 households belonging to the faith community, representing more than 250 individuals in total, contributed volunteer time and/or financial resources to the effort. Notably, CCR exceeded its fundraising goal for the work by 30%. And one CCR member even recruited a local Boy Scout to undertake the landscaping and hardscaping surrounding the new ramp as his Eagle Scout project. 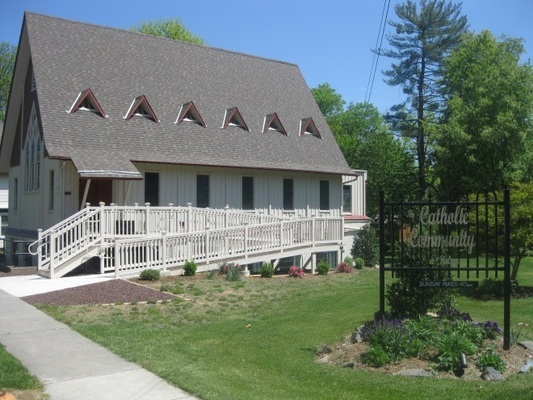 CCR is an intentional eucharistic community located in the historic village of Relay, Maryland. It is ecclesiastically approved by the Archdiocese of Baltimore but different than a traditional parish. Visiting priests, usually from religious orders such as the Franciscans, Jesuits, or Trinitarians, celebrate mass on Sunday. Beyond that, each member of the community takes full responsibility for running CCR. “An underlying theme is that every member has a vested interest in the church. We are all responsible, from managing the finances, to emptying the trash, to cleaning the church. Volunteerism is something we see in every aspect of what we do,” states Greg Bean, CCR member.